There are many smart home lights in all sizes and shapes. But there is no app-controlled moving light yet. It is common in nature forlight to move. The sun, fire, northern lights, shooting stars or sunlightreflected from a water surface are just a few examples. This moving light has afascinating effect on us. MovingLight brings this fascination into the home. Since MovingLight is a prototype, the design should be compact, material-saving and easily replaceable. The appearance is therefore characterized by the exposed electronics, wiring and screws. The 3D-printedparts have no form-giving function. They are purely functional. To prevent the lamp from falling over when moving, the centre of gravity had to be as low and centred as possible. Therefore both motors lie directly on top of each other. The electronics are located in the base for easypower connection. The motors are stepper motors, which are particularly suitable for soft and precise movements. In order to get the suitable 3D print file for other stepper motors with different dimensions, a parametric model is available on shapediver.com. Only individual dimensions of the motors have to be entered and the 3D model can then be downloaded as a stl file. All parts you need. Not shown: Power supply DC Jack 2.1mm and Micro USB. To build the app you need to log in to Blynk. Then create a new project and choose as device Arduino Uno. Select as connection type BLE. A token will be sent by e-mail. Insert this token in the code. The settings for the individual buttons can be seen in the pictures. Then screw the lower arm to the base and the feather boards. The motors produce a very high and annoying sound as soon as they are screwed together. Like a kind of microvibration. Does anyone have a solution to the problem? In the next version the problems should be solved. More lighting scenes, color changes and different movements and movement speeds would be great. To connect your motor to the feather wing, please check the order of the wires. Connect feather Pin 11 with the input of the Neopixel Ring. 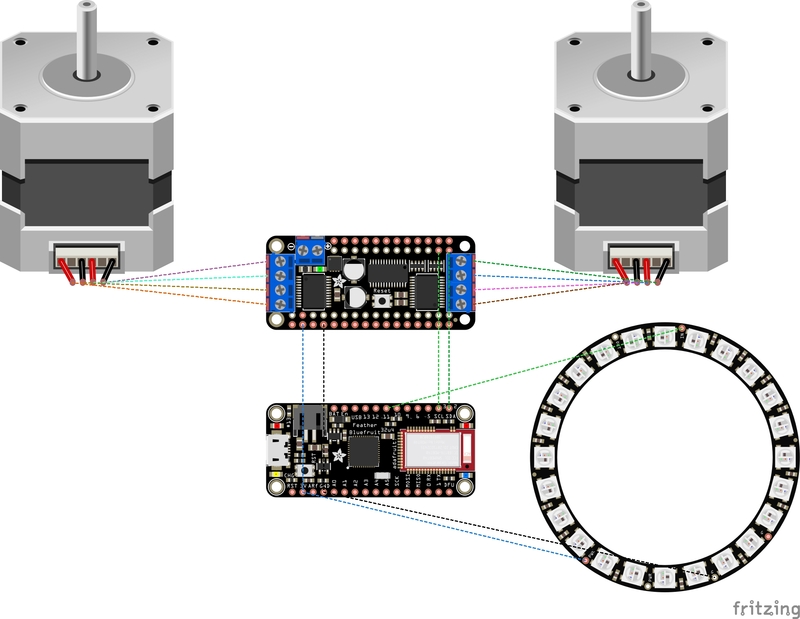 * motors and is controlled via bluetooth and Blynk app. // you can change these to DOUBLE or INTERLEAVE or MICROSTEP! // wrappers for the first motor! // wrappers for the second motor! // Stepper Motors. See Adafruit AccelStepper Libraray for details.